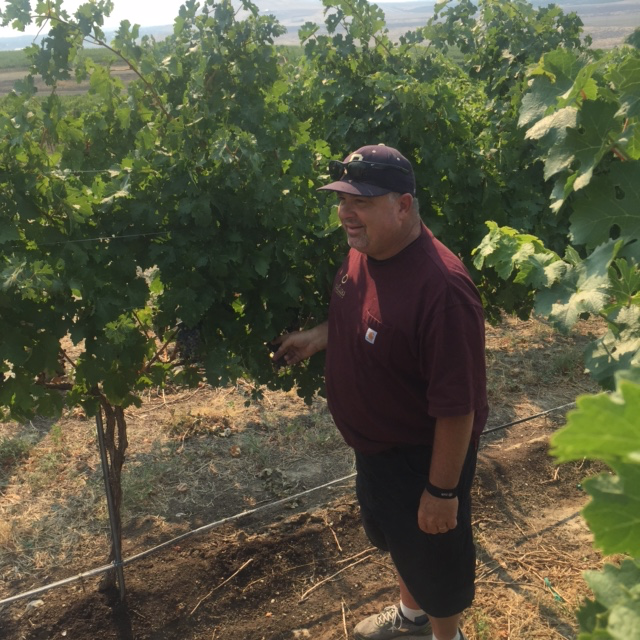 Before the busy season of harvest, each year we participate in an all staff vineyard tour of Red Mountain. This has always been one of my most favorite activities we do and this year it was by far the best year yet. Now I am not sure if it was more special because it took place in the morning (not nearly as hot as our usual time of mid-afternoon in July) or if it was the fact that it was just the Red Mountain staff who piled into Charlie’s truck early in the morning. 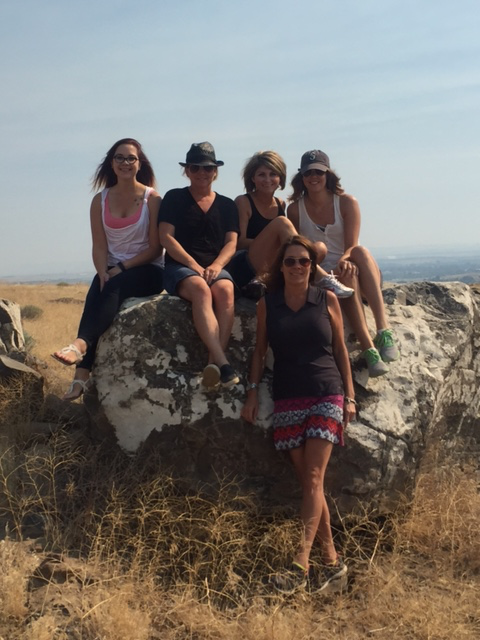 Our first stop on the tour was the beloved Fidelitas Estate Vineyard, located outside our doors on Red Mountain. Our Estate Vineyard consists of 13 acres, predominantly Cabernet Sauvignon of course, along with Merlot, Cabenet Franc, Malbec and an acre of Petit Verdot coming together to create the future of Fidelitas wines. We then travelled over to the Canyons Vineyard; this vineyard was planted just in 2009 and is about 56.9 acres on a 6.3% slope. The debut of our 2013 Canyons Vineyard Red Wine is sourced from block 11 and the photo below shows you just how steep of a slope we are talking about. 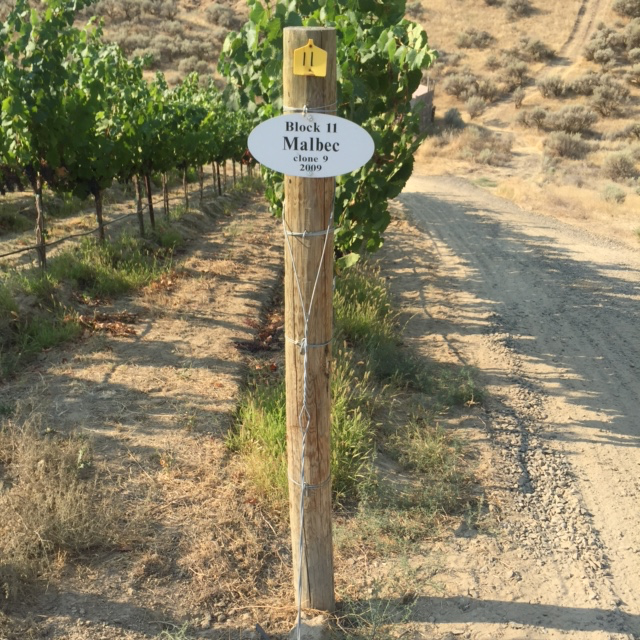 From there we traveled up around Shaw Vineyard, which has about 175 acres of Cabernet along the Northwest corner of the appellation. Then passed through the Red Heaven Vineyard, another one of my favorites. Red Heaven had an interesting aspect to their vineyard; there were several vines that have been grafted. 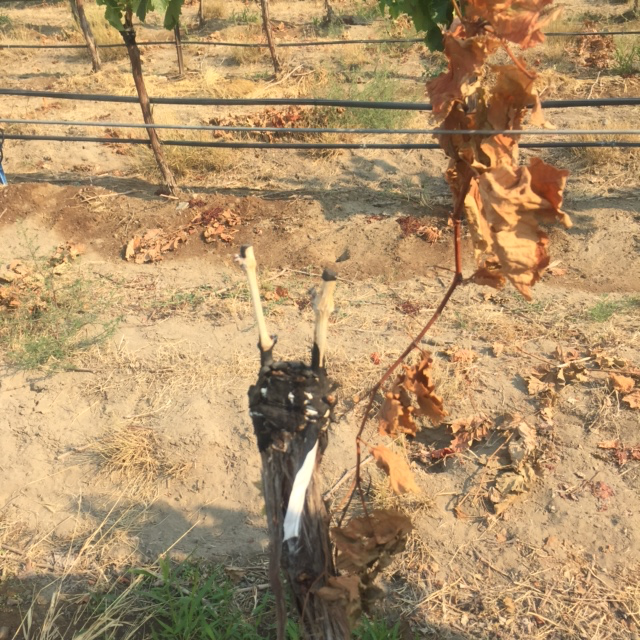 They are grafting over from a different varietal which is very interesting, for example the base and root could have been Zinfandel and then Cabernet Sauvignon was grafted and it will grow as such, this is done for varietal purposes and not from damage to the vines. How cool is that! Then, we travelled up Antinori Road and went through another one of my favorite vineyards (can you tell I have a lot of favorites?) Quintessence Vineyard. This vineyard was planted in 2010 and is showing exceptional fruit coming from its vines. 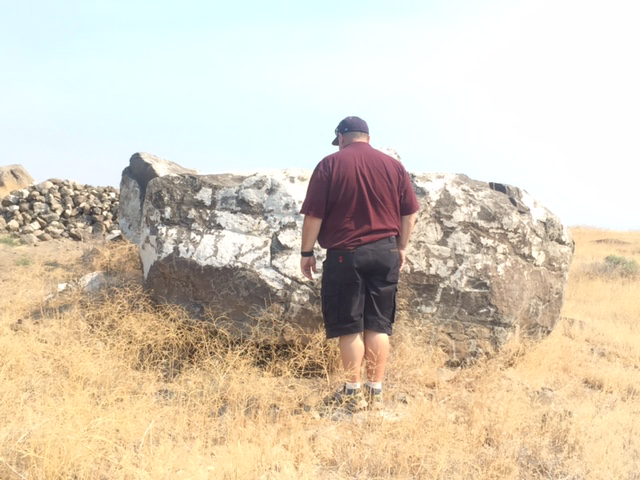 We even explored a new area I had never visited before, just by the pond there is a block of clone 412 that Marshal Edwards (Vineyard Manager) planted for Fidelitas. 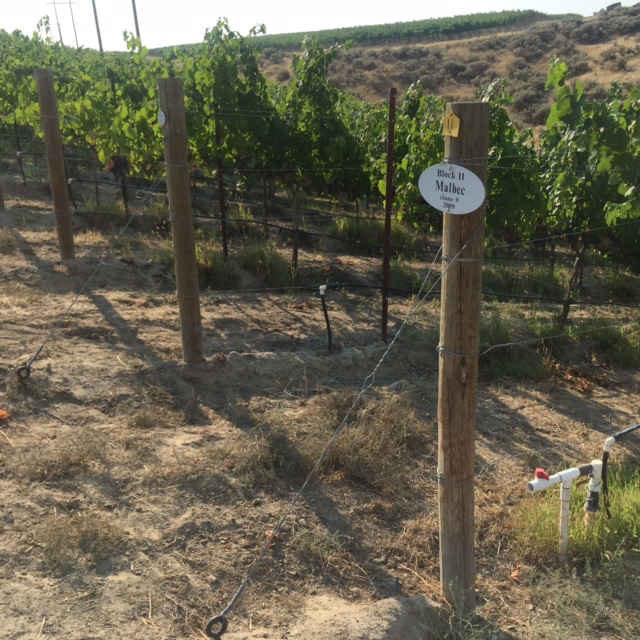 Calcium carbonate can be found in the Quintessence Vineyard however brown loam soil was brought in to create topsoil. 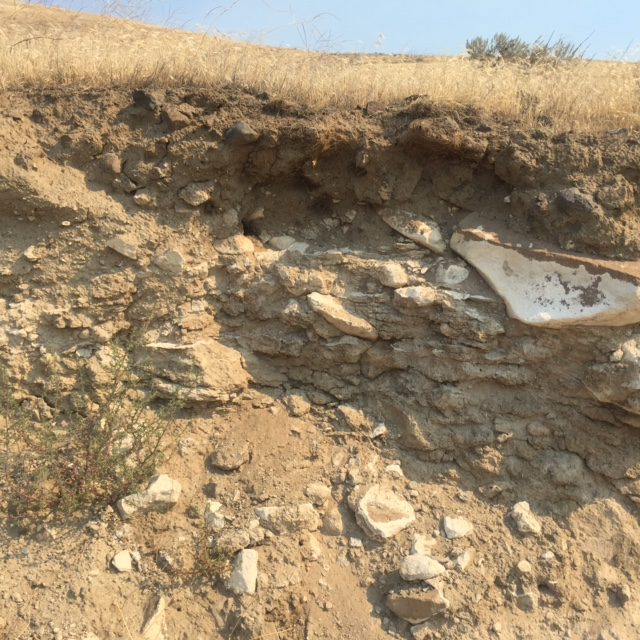 The photo below show the many layers of soils found from this vineyard. Keeping with tradition we had to take our staff photo, after Charlie searched the area for snakes, the coast was clear. Cheers until next years tour! The sun is finally shining in earnest and fresh peaches are in season! I have a hard time thinking of anything that could be better than that. 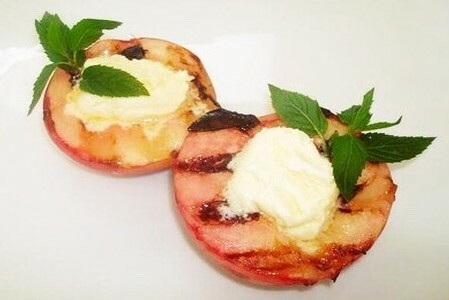 One of my most favorite summertime recipes is Grilled Peaches with Amaretto Spiked Mascarpone. If you haven’t yet had the opportunity to grill stone fruit, stop, drop everything, and head to your local farm stand or grocery store. Grilled peaches are the epitome of summer! They are sweet, juicy, and luscious. I’ve combined them with rich, velvety, Amaretto spiked Mascarpone. It melts into the warm fruit and adds a layer of depth, making each bite explode with sweetness and creaminess. By itself, the grilled peach and mascarpone is heaven in your mouth. Combine it with our 2015 Klipsun Vineyard Semillon and rest assured, it will be the star of your evening. The sweetness of the peaches compliments the ripe pear notes and combined with the roundness of the wine, makes the perfect pair. Grilled Peaches with Amaretto Spiked Mascarpone and 2015 Klipsun Semillon is a light, refreshing, picture-perfect ending to your summer meal! Place a grill pan over medium-high heat or prepare the outdoor grill (medium-high heat). Lightly brush the grill pan or rack with oil. Place the peaches on the grill pan and do not move, otherwise you will not have great grill marks. It takes about 2 to 3 minutes per side to achieve this. Grill the peaches until the grill marks are formed, slightly softened and heated through, about 5 to 6 minutes total. Combine the Mascarpone cheese with the brown sugar and Amaretto or almond extract and mix until smooth. Divide the Mascarpone Cream equally, topping each grilled peach. Garnish with Fresh Mint. 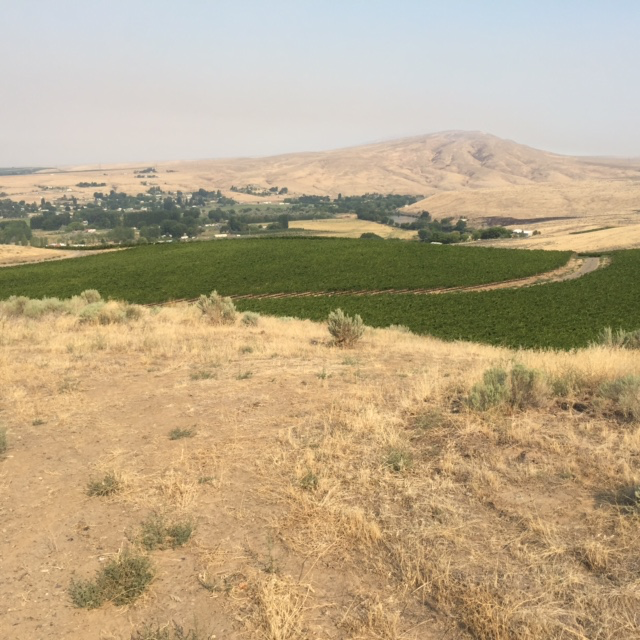 You probably already know that Fidelitas has an Estate Vineyard on Red Mountain. That’s where we have our 3-acre 2009 planting of Cabernet Sauvignon (Clones 2, 6, and 8) that are absolutely thriving. 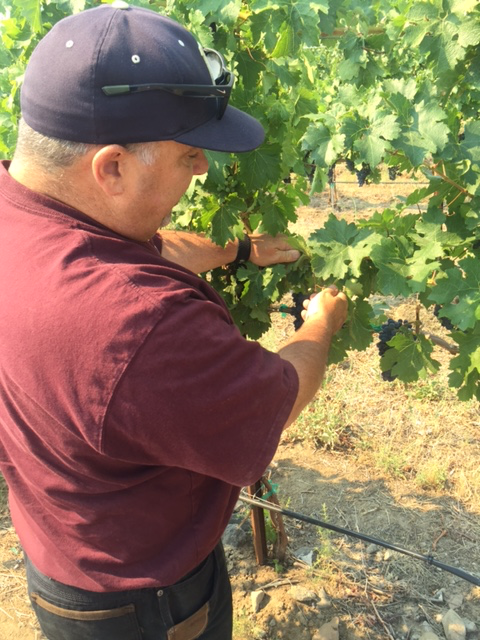 The 2013 Fidelitas Estate Vineyard Cabernet Sauvignon is to be released next month! You may even know that in Spring of 2015 we planted 9 additional acres in our Estate Vineyard, and the babies are looking good! 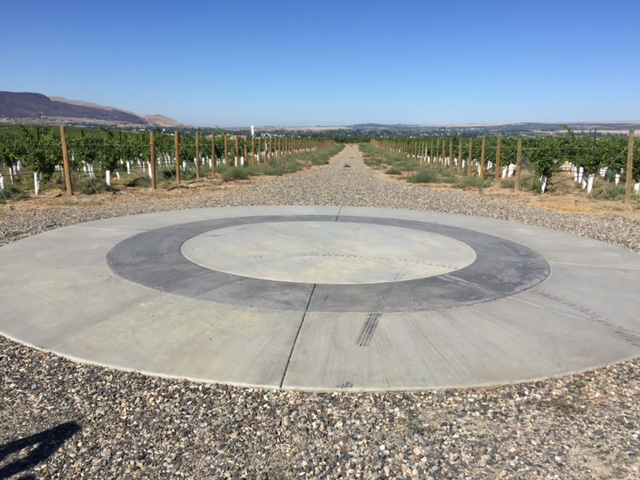 But did you know that we also poured a giant concrete circle smack dab in the middle of the vineyard? From space you might think it’s a helicopter pad. From the ground you might think it’s a dance floor. We think it’s the perfect place to host our annual Estate Vineyard Winemaker Dinner. 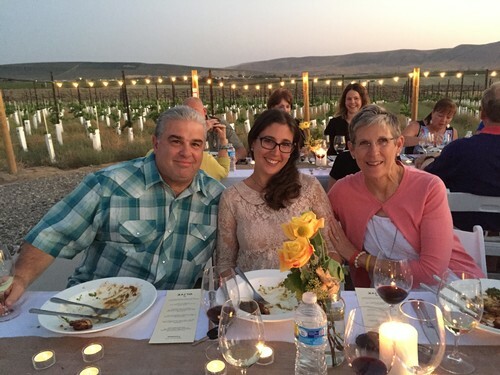 Join fellow members, friends, Charlie, and Team Fidelitas for dinner between the vines during harvest season on Red Mountain on Saturday, September 10th. Ethos Trattoria will be preparing a multi-course dinner paired perfectly with Fidelitas wines (check out the menu here!). I think we can easily say that this dinner is an event that is close to our hearts. 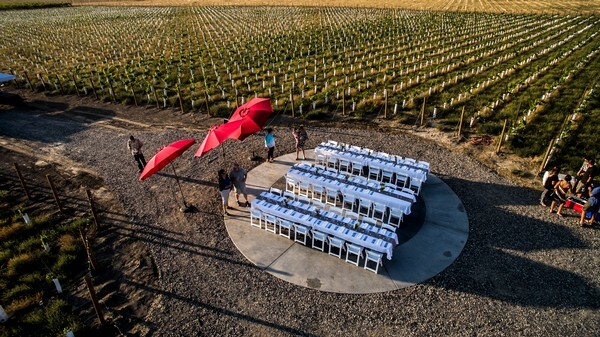 Owning his own vineyard and winery on Red Mountain has been Charlie’s dream for decades (sorry to date you, Charlie) and now we come together each year to celebrate this reality and toast to the future of Fidelitas. This is an intimate dinner and seats are limited. Dinner attendees are invited to join us for an Estate Vineyard walk Saturday morning, featuring a vertical of past and future Fidelitas Estate Vineyard wines. $525 for two dinner tickets + 6-pack of 2013 Fidelitas Estate Vineyard Cabernet Sauvignon or $95 each. We’ve set up room blocks at our favorite Tri-Cities hotels and I’d be happy to help you plan your trip. If you can’t make it to the dinner but want to reserve the 2013 Fidelitas Estate Vineyard Cabernet Sauvignon before its release, let me know and I’ll make sure we have some with your name on it. We hope to see you in the vineyard!